I found this remarkable video diary thanks to a link on the Thoughts on Public Education blog. In a week where we received depressing statistics on rising poverty levels for families, this is a matter-of-fact look at what it is like to be a young family living in poverty in San Francisco. The video is narrated by mom Valerie Klinker, who speaks in the voice of her 17-month-old son Terreace, imagining his world as he experiences it. Over the past 10 elections we have averaged 47% voter turnout of eligible voters. That’s abysmal for a city that considers itself to be politically savvy. Less than half of our population is participating in the democratic process; electing our leaders, and making important decisions for the future of our City. There’s no silver bullet that will magically ensure 100% voter participation, but the decision to hold our elections on Tuesdays is one that was made 150 years ago in a different era. It was a Judeo-Christian society where individuals would have their days of worship on the weekends, pack up their horse and buggy on Monday, and travel into town squares to conduct their business, which included voting. We decided 150 years ago to host elections when it was convenient for people to vote, but today, how is hosting an election mid-week in any way convenient? Are we encouraging people to participate in the democratic process by hosting elections on a day when families have numerous obligations? Changing elections to a day where people have fewer obligations is a step we can take towards making voting and participation in our democratic process more accessible, and I hope it’s a step you’ll take with me. Extend opportunities to vote by opening all polling places on the Saturday before a Tuesday election. Maintain traditional Tuesday voting, as well as all other means of voting, including absentee and early voting. Not cost taxpayers one dime, since all costs associated with the Saturday Voting Act will be donated by organizations and individuals. Engage our youth to participate in the electoral process and become more active participants in our neighborhoods, our schools, and our future. Why Tuesday, indeed? To get involved or learn more about the Saturday Voting Act, visit whytuesdaysf.org or come on by the kickoff event this Saturday, April 3 at the Ella Hill Hutch Community Center (1050 McAllister St. @ Webster) at 11 a.m. San Francisco registered voters can get a petition and start collecting signatures now! Tonight’s Committee of the Whole meeting focused on several facilities issues, the most interesting of which was a presentation on the possible options for a school site in the Mission Bay neighborhood. As part of a deal with the developer and UCSF (which has already built incredible biotechnology and science research facilities at the site), the school district has been given the option of building a school on a 1.5 2.2-acre corner lot. 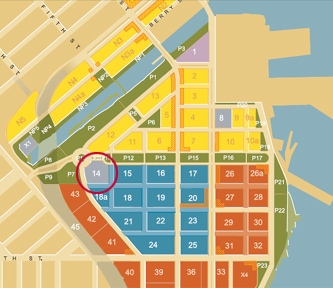 (A land use plan is here; the proposed school district lot is #14). The research conducted by the San Francisco Redevelopment Agency seems to bear out what anyone can witness with casual observation: there are a large number of very young children in the area. There also is not a school nearby: the closest schools are Bessie Carmichael in the South of Market neighborhood, and Daniel Webster Elementary in Potrero Hill (a school to watch!). So the possibilities are very intriguing – we have a prime plot of land in the middle of a world-class research facility and a rapidly gentrifying neighborhood with a lot of young families; and a plot that is not far from some of the least-served (education-wise) neighborhoods in San Francisco. Originally, the idea from City Hall was a science and technology high school, but based on the preliminary analysis we’ve done as part of our student assignment redesign, it looks like what we really need is an elementary (K-5 or K-8) school. In addition, it would be smart to take advantage of the incredible intellectual capital at Mission Bay, and use it to establish a prestigious teacher-training institute that would grow sorely-needed math and science teachers right in our own backyard. What will the site support? According to our Facilities Director, we could build a multistory building that would house a 500-student school and a teacher training institute without much trouble. But because a K-8 school would require more facilities (e.g., a gymnasium), his recommendation is that the site would more easily accommodate a K-5 school. On the other hand, in early conversations, UCSF has expressed deep interest in a middle school, with the idea that middle school students would really benefit from the exposure to the incredible science going on around the school. Finally, what can we afford? We have existing bond authority to spend $30 million on a new school, which is good, but the Mission Bay site (because it is situated on landfill) is an expensive place to build. In addition, the Board has increasingly focused on the Bayview neighborhood as an area that needs better attention and resources. The Bayview and its surrounding neighborhoods are the areas where most of the public school children in San Francisco already live; schools in those neighborhoods do not currently have capacity for all the students who live there, and in addition they are generally our lowest-achieving schools. If, as it appears, the Board reverts to an assignment system that puts more weight on where children live in deciding school assignments, there are both practical and equity reasons to make sure that there are ample high-quality school choices for children in every neighborhood. So might it make more sense to construct a state-of-the-art school at one of our Bayview sites? Unfortunately, my gut sense is that the Mission Bay AND the Bayview scenarios both make compelling sense, but there is not going to be bond money to do both, at least, not without going back to the voters. That is a risky proposition in today’s environment, and one that takes time and careful planning. The City is willing to commit funds to a study of the best uses of the site, but that study can’t move forward until the school district gives a clear indication of whether it’s interested in proceeding. The new student assignment policy is a key “domino,” so getting this plan done on time (drop dead is March 2010) will be essential to moving the Mission Bay/Bayview discussion forward. After the Board commits to a new student assignment policy, the Superintendent will formulate a recommendation on Mission Bay – the Board needs to either commit to moving forward or decide to put off the project for now. The district has until 2027 to exercise its option to build a school at the site; after that, the land will revert to the developer. The roses in our jewel-like garden (enter from Fulton & Park Presidio Blvd or JFK Drive just west of the De Young Museum) are at their peak just around the Fourth of July. Magnificent!